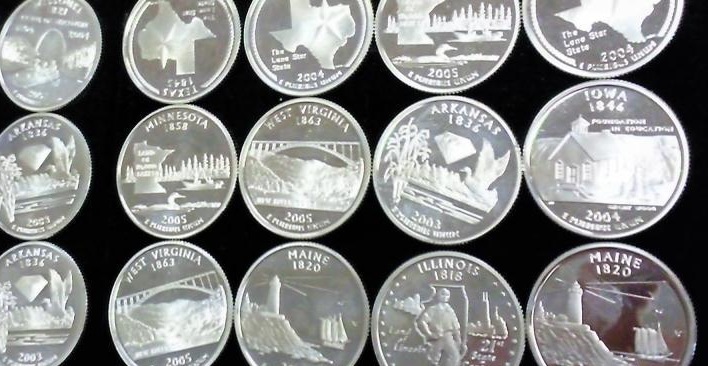 You’ve probably had at least one of every state quarter in your pocket or purse at one time or another. And now you could be wearing the coin on your finger, or say, on a chain around your neck (Hint, hint Mrs.MagpiesTreasures on Kickstarter). But here are some things you may not know about the state quarters rolling around in your piggy bank. Heads, I win; heads, you lose! Want to win your next coin toss? If you want to win the bet, pick “heads”. George Washington’s visage appears on the front and back of two state quarters. He can be seen on Mt. Rushmore on the back of South Dakota’s 2006 quarter and crossing the Delaware River on the back of New Jersey’s 1999 state quarter. Heads, I win; heads, you lose! There is only one state quarter to depict royalty on it. The 2008 Hawaiian state quarter has King Kamehameha I on the back along with the motto “Ua Mau Ke Ea O Ka Aina I Ka Pono” (“The Life of the Land is Perpetuated in Righteousness”). Technically, there is a King Salmon on the back of Washington’s state quarter from 2007 but I choose to ignore fish royalty. There are four vegetarian state quarters. The peach on the back of Georgia’s 1999 state quarter. Maple syrup (in the form of maple sap being tapped, not REAL maple syrup) appears on Vermont’s 2001 state quarter. Cheese and corn are on Wisconsin’s 2004 state quarter. Wheat is shown on the South Dakota 2006 state quarter, making the South Dakota quarter the only state quarter that is not gluten free. The mint has plans for many more quarters over the next several years in its “America the Beautiful” program, featuring national parks. This ensures that there will be many more things of interest to be seen on the back of your pocket change in the future, so keep looking. Got a fun coin fact to share? Post it in the comments below! ← Is this REAL silver?